Twenty-five years ago, legendary designer Dapper Dan shut down his Harlem store after he was accused of counterfeiting designs by couture houses. (His custom-made creations became as popular as the runway pieces he allegedly copied.) 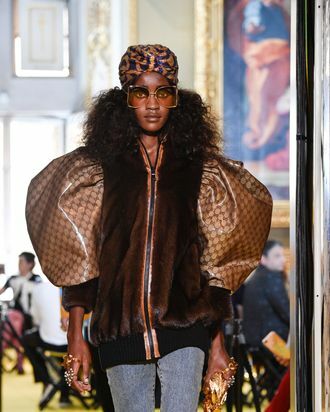 Another controversy between Dan and a couture designer emerged at Gucci’s resort show just three months ago, when a mink coat with Gucci-logo sleeves appeared on the runway. It looked eerily similar to a coat Dapper created for Olympic runner Diane Dixon, but her sleeves had the Louis Vuitton logo. Soon after Gucci’s show, addressing outrage on social media, designer Alessandro Michele released a statement on Instagram saying he made the piece to honor Dan’s work, though Michele admitted he hadn’t reached out to him to collaborate. Now, the two men are apparently friends and soon-to-be collaborators. In a new profile published in the New York Times today, Dapper Dan announced he will reopen his iconic shop in Harlem with help from Michele, release a capsule collection that will be sold in Gucci stores by next spring, and become the face of Gucci’s new tailoring ad campaign. “What I’m most excited about is being able to work in the open,” Dan said. Michele also acknowledged the importance of the black community’s presence in the fashion industry, saying, “I understand that I am putting my hands in a kind of very delicate playground. But I love the black community. I think they have a big voice in terms of fashion.” Per the Times: “For his part, [Dan] remained mostly silent on the issue,” making this an even more unlikely pair.